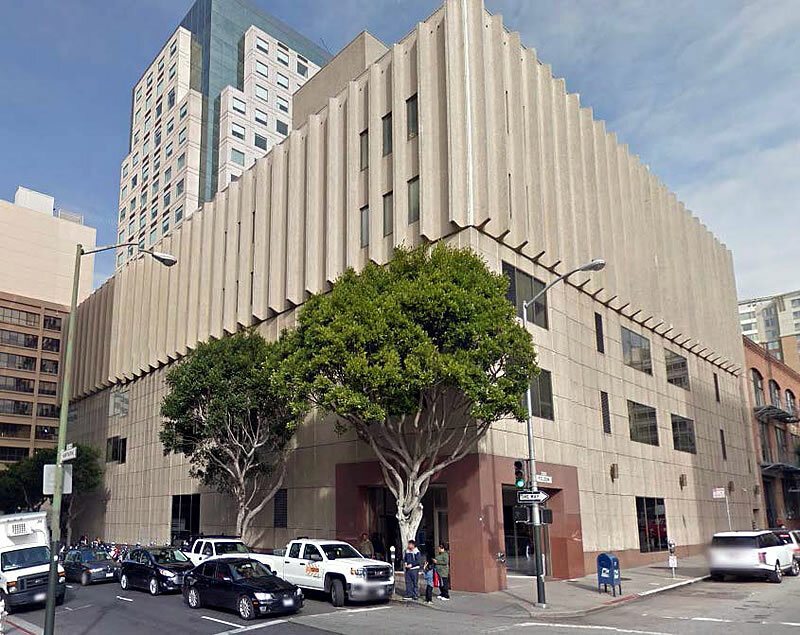 As proposed, the five-story office building at 95 Hawthorne Street, which formerly housed the San Francisco Passport Agency on the northeast corner of Hawthorne and Folsom, will be razed in order to make way for a 32-story residential building to rise. Designed by Skidmore, Owings & Merrill (SOM) for the John Hancock Life Insurance Company, which owns the property, the new tower would reach a height of 320 feet and yield 330 apartments over 8,000 square feet of ground floor retail space (primarily fronting Folsom Street) and an underground garage (with its entrance on Hawthorne) for 250 cars. 2. The Planning Department requests the building design establish a clearly defined base to better define the street wall, per the intent of the Code. 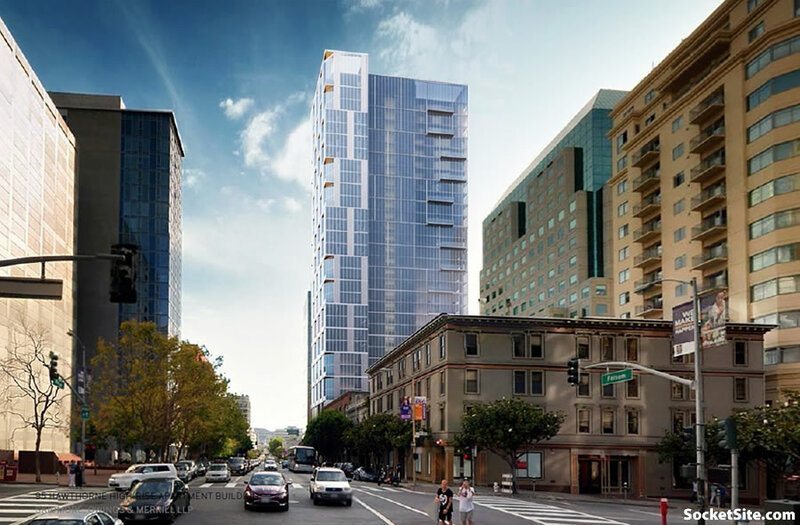 Recommended means to accomplish this include a 12’ tower setback on Folsom above the base, a cornice projection, and design differentiation of the base from the tower. We’ll keep you posted and plugged in as the plans and approval process proceed. A “cornice projection”. For f*ck’s sake. Yeah, I know. I’m not a fan of the proposed design, but it’s a heck of a lot better than the current prison wall of cement. What’s with all these renderings of people hanging out on their balconies? I think the building looks fine, but I don’t like the bright orange accents. When I see that sort of thing on new buildings around town, it reminds me of public housing projects adding squares of bright colors their otherwise non-descript concrete towers, under the idea that it will improve the mood and disposition of the residents. Maybe it does, but I think it’s a little silly. Are you upset by the idea of a cornice or by the redundancy contained in the phrasing? Because there may be room for the parking spaces, but there’s no more room for those cars to drive around town. It’s total gridlock downtown already. Stop holding onto the past, SF is going the way of the European and Asian capitals, it will have to begin measures to actively limit cars soon. At least in certain areas at certain times. And planners know this, and they are looking to the future. Don’t forget self-diving cars. Once those are a reality, far fewer people are going to want to drive themselves…if it’s even still legal. It would be helpful if our Federal government wasn’t control by anti-tax morons who scream “SOSHULIZM!!! !” every time somebody suggests we raise taxes or spend money on something. Major public transit projects are basically impossible with either (a) Federal funds from the FTA or (b) a major local/regional tax measure (through bonds or otherwise) to fund the capital projects. Its SFMTA or “planners” who aren’t providing these things. Its the voters. Neo-liberal and libertarian dolts can’t quite understand the connection between low taxes and crappy infrastructure, crappy health care, and crappy education. It all has to be the fault of brown people and hippies. Wow do you really believe what you say. Do you realize 60% of the Federal Budget is spent on social programs! How about you make statements that are more constructive like; take some personal responsibility and plan for your own funded retirement, take care of your body so you won’t become a huge health liability. if people did that and stop expecting a free handout maybe this country would have the appropriate funds for public transit projects! @two beers: Wow, you’re not one to be deriding anyone for being a “dolt”. LOL at “low taxes”, apparently nobody told you that our sales, state income and property taxes are all among the highest in the nation. Wow, Davester. Social Security and Medicare are not “handouts.” We pay into them when we are younger and working so that we have a pension and healthcare when old or disabled. I ride Muni all the time. No amount of money will get us there as long as Muni’s human drivers and their union remain; the only way for us to get to the level of (some) European/Asian public trans efficiency is to replace them with technology. We may not be too far away, at least partially, if Google or Tesla is to be believed. Google recently said it could be 30 years, but they are known for their optimism. Well, sort of. Still PLENTY of cars in London and Paris, plenty of gridlock, but they impose some fees for going into the inner cores. And London and Paris still work beautifully even with the cars. …just a lot fewer cars than they would otherwise have. AMEN! Why people choose to drive in solo everyday baffles me.I dont think the right shouldnt exist….but we should not encourage policies that support more solo cars (or cars in general) on the roads. Oh please, you’re starting to sound like the leaders of North Korea. Really? the right to drive solo should NOT exist? What next? force people by law to ride two to a bike at all times? I didn’t say that. Take a breath, re read the comment. Well let me ease your bafflement a bit. My daughter’s school opens at 8:20. If I drop her off and try to get to my office near the ballpark via bus and BART, I will likely get there at 9:30 at the EARLIEST, which doesn’t really sit well with my employer. Then, when I get out of work at say 5:30 – same story getting home, so I’d be late picking her up from aftercare, which doesn’t really sit well with them a they charge for every minute you are late. This doesn’t even take into account the time that I might want to hit the pool after pick up, or maybe walk my dog or have time to make dinner. By car it takes me 20 minutes, door to door. If you are still confused, I can’t help you. Makes sense. I agree bus then a Bart/muni transfer doesn’t make sense. I’m lucky in my house and work are both 10 minute walks to Bart and I enjoy walking. I get it not all people have that blessing. But many more do that don’t take advantage of it. I know several personally, but like I said it’s a choice you can make, but I think it should be discouraged. But if you have to, sure you can. current bad eyesore, and underused land. good architect, good design now. 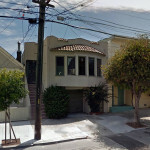 the building allegedly design by norman foster on mission near 1st could take some lessons here. re scale, color, details, skill. Both were designed by SOM. I wonder why they made them so similar. Well 95 certainly is ….uhm, “unique”. It looks like one of those things you would make w/ Build-a-Rama, where you tried to do that skyscraper on the lid, and then realized you needed the deluxe set…all you had were a bunch of parts to do the bottom; would be nice to have some history on the building to find how how/why it ended up like that. The passport agency is no longer located in the building. They moved to the Federal Building a couple of months back. My son went to child care on the ground floor of the structure from 1993 through 1998, on the ground floor and connected to the building at 75 Hawthorne. The neighborhood continues to evolve. Wouldn’t it make more sense to remove the carve-out? 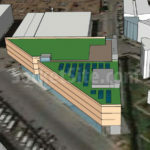 In what universe does it make sense to sacrifice 50’x3’x32 stories = 4800 square feet of housing in order to preserve 150 square feet of parking? That sidewalk carve-out is ridiculous. And I can’t even understand why. The motorcycles aren’t that long, and slanting the spaces could make them fit in the same envelope as the car spaces right before and after them. Somebody really didn’t think things through. Anyway there’s no reason to change the building for this silly screw-up. Just adjust the sidewalk back to full size. As it stands now pedestrians have to walk in the street to pass by each other. 1/2 a parking place for each unit housing, most frequently, two adults with an average of 1 1/2 cars. People won’t have cars if they can’t store them nearby when they aren’t using them. Would you? So one more garage entrance on Hawthorne. That makes roughly 5-6 (maybe more, I can’t remember off the top of my head right now) on the street from Howard to Harrison. If I remember correctly, there’s a plan to turn Hawthorne into something of a thoroughfare to move traffic from FiDi to the bridge more efficiently due to 2nd street turning into a traffic-calmed two lane oasis. One issue rears its head again. That is the failure to tie major development to transit and infrastructure improvements. This project is kitty corner across from the Canton project. 150 or so condos and behind that Canton development will be another new wrap-around condo development. Perhaps as many as 300 units all told if I recall correctly. The roads can’t handle this and transit improvements are years (decades?) away. Its unfortunate there is not regional planning and specifically as to new residential and office construction. The East Bay right now is better suited to handle major new development. 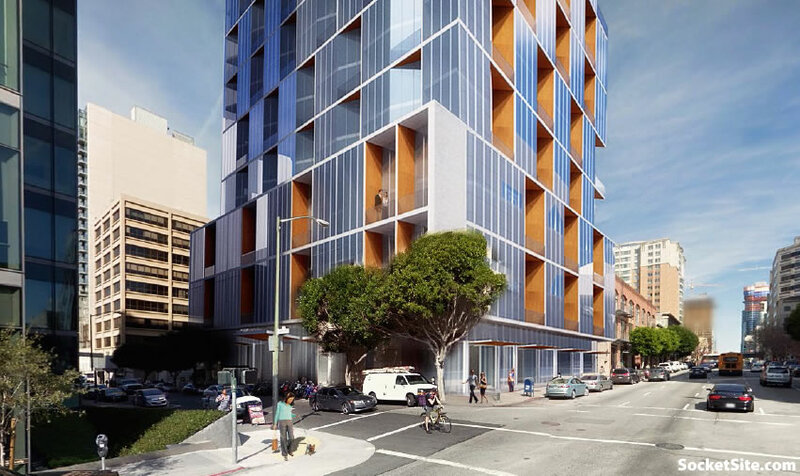 If there was a regional Planning Commission and zoning there could be a regional freeze major new office development in SF for a decade and restrict housing development. Shifting all that development instead to the East Bay. This too would take pressure off BART which is at capacity in terms of the tube and rush hour commuters. Similar situation for the BB.